So here's my latest creation: BIG scarf with pansies. Do you like it? Hand painted scarf with four Red Pandas. The cutest scarf I've ever painted! One more cherry blossom composition, now I'm trying it with different color set... so how do you like it? Turquoise and purple scarf with lilac flowers... my favorite! I love strong, cheerful colors, as I am and always have been enhanced by sun and lights. My passion is painting in watercolors and on silk; two mediums in which creating light-shade effect is of the most importance. For painting silks I use only natural silk! I love the delicate touch of this gorgeous material and hundreds possibilities that it gives to the creator. I'm always looking for inspirations, and my main interest lays in nature and Art Nouveau. 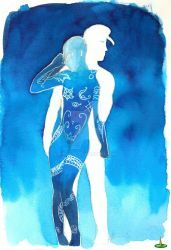 Silk painting commision info: just note me! If you like to contact me please feel free to send a note! I would love to hear from you! Have a great Bday lovely Luiza!